when we are going to contact them officially!! When he claimed political asylum, then it would be impossible to bring him back!! This is just a public petition... I’m confident when Govt contacts them through proper channel and after that agreements been done, they will hand him over. humaray Bhikaari mulk key saath aisa hi hona chahyee.................these corrupt politican never ever made that deal so they will keep themselves safe. They will come up with a similar excuse for returning looted funds. Guys like Ishaq Dar and Altaf Hussain are their stooges, pawns, to be used at the right time. Fact is, despite the lack of a mutual treaty, the law allows for ad-hoc arrangements. Pakistan has extradited criminals wanted in the UK in the past. 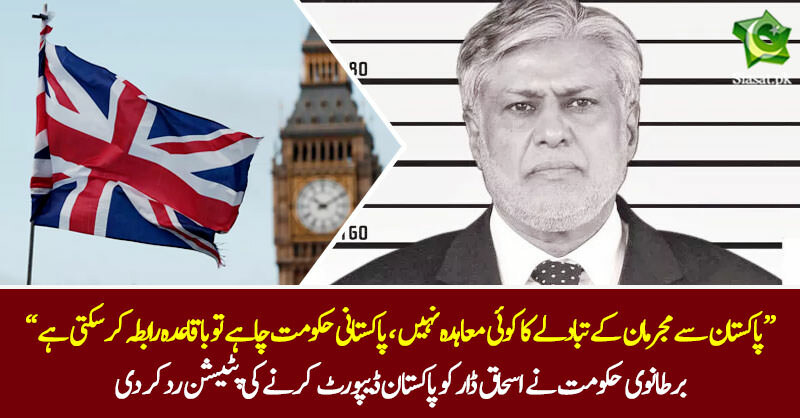 In this case, the allegations aginst Ishaq Dar are massive..and not sure why UK wont consider it and try to give it a political hue. Sajid Javid The British Home minister will be visiting Pakistan soon and the agreement will be made between two Governments. UK is home to Absconders and Terrorists from rest of the world. In UK if the number of people who sign the petition is more than 10,000 then the governement has to give a respose.When the number of signatures exceeds 100,000 then the petition is considered for a debate in parliament.The government is under no obligation to act .Millions of people signed a petition against Trump's visit to UK.There was a debate in the parliament but the visit still went ahead.NAB/FIA lawyers need to do their homework and file a criminal case against Dar .A red warrant must be issued through interpol to arrest him. Great Idea kakmuna420. This can be a viable option to do the tapori work. What do you expect from a nation whose queen wears a stolen diamond on her crown. What r u going to do with him after his repatriation? We have thousands of such dacoits here. Try to apprehend them and extract people's money.